In some applications it is necessary to control starting torque and speed steplessly i.e. smoothly. In textile machines such type of control is necessary to avoid breaking of threads. Such a starting arrangement is called soft starter. 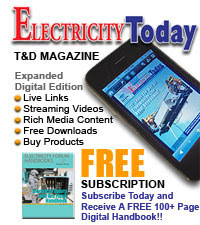 The thyristor voltage controller method is commonly used in the soft starter. The Fig. 1 shows such a thyristor voltage controller scheme used to obtain the soft starter. T1, T1', T2, T2' and T3, T3' are the thyristors. Two thyristors are connected in antiparallel in each line. 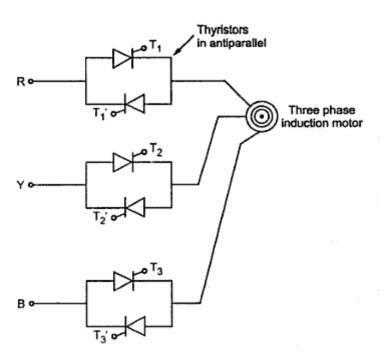 The thyristors are the triacs. To control the voltage applied to the stator, the firing angle of the triac is controlled. For the scheme shown, the firing sequence is T1, T3', T2, T1', T3 and T2'. The interval between the successive firing is 60o while the firing frequency is six times the input frequency. When T3' is fired, T1 and T3' conduct for. Then T2 is fired and T3' and T2 conduct for next 60o. The cycle is repeated. Each triac conducts for 120o, once fired. As long as thyristors is fired, it conducts and correspondingly voltage is variable to the stator. Thus by controlling the firing angle, the voltage applied to the motor can be controlled steplessly. The rotor induced e.m.f. 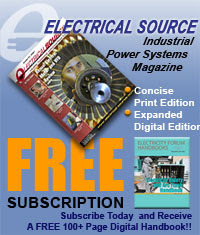 E2 depends on the stator voltage while torque depends on E22. Thus by controlling stator voltage smoothly, the torque can be controlled smoothly while speed also gets controlled smoothly from zero to the synchronous speed. Due to reduced voltage applied the starting current is small and need of the starter is eliminated. Hence the arrangement is called soft starter. A three phase saturable reactor in series with a stator also can be used for soft start. The saturable reactor has d.c. control winding. The reactance of the saturable reactor depends on the current through the d.c. control winding. Thus by smoothly controlling the current through the d.c. control winding, the reactance of saturable reactor can be controlled smoothly. When the reactance is very high at start, starting torque is almost zero. Increasing the control winding current, the reactance decreases and the torque increases. Thus the motor starts without any jerk and soft stepless starting of motor is achieved. 1. Absence of torque pulsation hence no jerks while starting. 3. Due to use of electronic devices like thyristors the weight, size and cost is low. 4. The simpler control is possible. 5. he efficient operation is possible.